A Cleveland-area auto worker has been indicted for allegedly stealing thousands of tire sensors at a Ford plant and selling them on eBay, causing a brief interruption in vehicle production. According to a report on the website of Newsnet 5, an ABC affiliate TV station in Cleveland, Joseph Jankulovich, 48, of Sheffield, Ohio, faces felony theft and receiving stolen property charges related to his alleged theft of Ford OEMS tire sensors from Ford's Avon Lake assembly plant. The detective said the parts cost auto dealers up to $100 but were allegedly sold all over the world on eBay by the suspect, who charged customers in the $10 to $20 range. He added that the auto parts “were sold internationally,” including to Germany, and “it was a very good value to buy this at the price he was selling them,” Newsnet 5 reported. A Ford spokeswoman declined to comment because the matter remains the subject of an ongoing investigation. It was not clear if other plant workers were under investigation. The report said that over a period of time police made several purchases of the tire sensors, tracing them back to the vehicle plant and to Jankulovich. Police said Ford estimated the value of the items stolen at more than $500,000, according to the TV station. 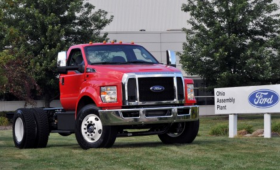 The Avon Lake plant, which opened in 1974, currently produces E-series strip chassis and F-650/750 medium-duty trucks. Tire Business in an affiliate of Automotive News.